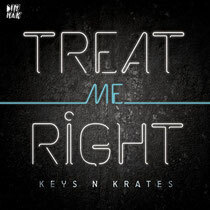 Canadian electronic trio Keys N Krates recently announced that their next single ‘Treat Me Right’ will be released on March 5, through Steve Aoki’s Dim Mak imprint. Premiered across the airwaves on Annie Mac’s BBC Radio 1 show on February 8, the tracks has been enjoying considerable support from the online community and has become a mainstay in the sets of artists such as TNGHT, Diplo, Annie Mac and Salva over the past few weeks. To celebrate the forthcoming release of ‘Treat Me Right’, the three band members recently revealed an exclusive behind-the-scenes ‘live performance video’ (above), featuring footage of them showcasing the hit track live in their Toronto-based studio. Keys N Krates formed in 2008 and are comprised of the high-energy Adam Tune on drums, David Matisse on keys, and Jr. Flo on turntables. Starting as a mainly live act doing live re-works of rap and house tunes, the group eventually moved into making their own beats and translating those into their live show. Download their Annie Mac mix for free below.